When you were first injured, the recipe for healing was likely surgery, rest, rehabilitation – or some sort of combination of these – as a means of making a full recovery. You knew it might not be easy, but you are now well beyond the projected recovery timelines that were set for you by doctors, and you are still suffering from chronic pain stemming from your initial injury. It's negatively impacting your life, and in more ways beyond just the pain. You can't work, your medical bills are escalating and you need to make modifications to your home to help you live more conveniently. Does this sound like your current situation or the circumstances of someone you know? If so, know that affected individuals could be privy to damages stemming from such conditions, no matter the initial injury. At Assiff Law, we can help you attain these damages you have a right to so you can better focus on your healing and recovery. The definition of “chronic pain” varies, but it’s typically described as any type of constant, debilitating pain that persists beyond the expected healing period. This may be three months, six months, or even years or more. However, beyond just living with debilitating pain, there are other dire circumstances that often stem from chronic pain. These often include medical fees, home modifications or adjustments to make living easier, job or income loss, and, arguably most significantly, a lesser quality of life. We understand how damages to cover the aforementioned may not help make the pain go away, but they can help a person’s situation. 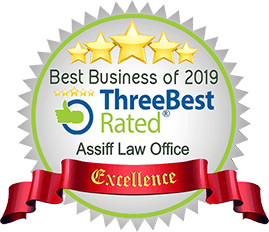 At Assiff Law, we are dedicated to fighting for the damages that are rightfully owed to our clients so they can worry less about the intangibles and focus more on the care and treatment to relieve their pain. Here at Assiff Law, we make every personal injury case, no matter how big or small, a priority. All of our cases begin the same way, by meeting for a one-on-one consultation with a client to properly assess their situation and formulate a plan on how we can best help them. Our office and legal staff are always here for our clients, from the initial consultation all the way to the end, and we are always just a phone call away to address any questions or concerns. This customer-centric business model is a big part of the reason why Assiff Law has become such a trustworthy and reputable firm. We are frequently recommended by our former clients for this very reason, as we dedicate the same amount of effort, resources and expertise to every case we take on. We understand how frustrating it can be to live with chronic pain, and that’s why we’ll make it our mission to fight for the damages that are rightfully yours. For more information on Assiff Law, contact us today about scheduling a free consultation. You truly have nothing to lose from meeting with us, as we will not collect any fees until we have won your case. Your case is important to us, and our actions in and out of the courtroom will show you that we mean business. With Assiff Law, you are not just working with a law firm – you are working with a partner you can trust and count on. Contact us today for more information.